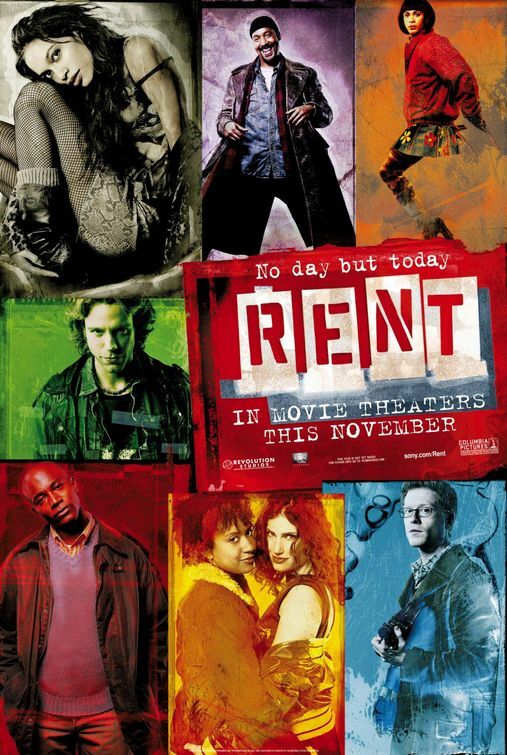 I should tell you, I should tell you … I really just don’t like RENT. I’ve tried. I’ve seen the show. Yes, it was in Toronto, and not on Broadway, but I still saw it. I bought the soundtrack a good month or so before the release of the film in an attempt to build some excitement. I think I listened to it once, twice tops. And finally this December, amongst a packed house of Rent-Heads, possibly some of the most unstable brand of fans I’ve ever met, I sat through this directionless film about a bunch of 20-something year old, aimless artists who would rather starve and freeze then sell out. It may be easier to say this as an artist who is writing this in his cubicle, having already sold out so he can afford to match his scarf to his hat to his shoes mind you, but I still manage to get more accomplished than most of the free-loaders in this film. I originally felt that perhaps my disdain for this show came from some unresolved issues with an ex-boyfriend who was a big Rent-Head. I would always tell people who asked that I did not like the show but followed that up by saying that I had this inevitable ex-boyfriend bias. It feels good to be able to say I simply do not like it now and it helps to know why. 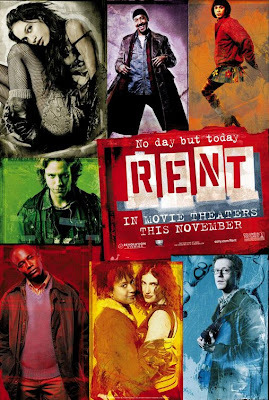 From a story perspective, RENT basically introduces you to a bunch of young artist types and shoves their values down your throat for the first two thirds of the film. Nothing really happens but we know an awful lot about the types of people who are singing. You’ve got singers and filmmakers, dancers and drag street drummers. Some of them have A.I.D.S. ; some of them shoot up a fair amount of heroine. Some of them take heroine and have A.I.D.S. What they don’t have is depth. The story relies on their plights to provide a deeper meaning but as nothing aside from the looming threat of losing their loft space transpires, you pretty much get the starving for your art thing within the first little bit. 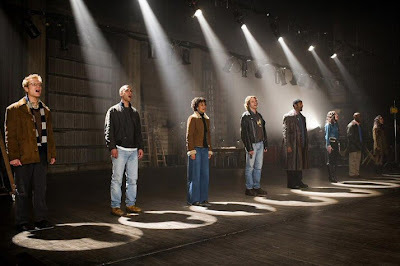 RENT makes for a better stage production than a film. It is mostly sung and that can get awkward when choreography is not involved. The stage is a more natural setting for this or at least more so than someone singing directly into the camera while riding their bicycle. In fact, I had my doubts about this translation from the start when it was announced Chris Columbus would be directing. It would be his first project since helming the first two “Harry Potter” flicks. I’ve got nothing against the young magician movies but this is a story of suffering, poverty and despair. I became more hesitant when I learned that the majority of the original Broadway cast would reprise their roles. This is a simple jump from stage to screen for people with experience like Anthony Rapp or Jesse L. Martin but is less successful for say Adam Pascal. Pascal plays Roger, a musician who barely leaves the house since his former flame died of AIDS. 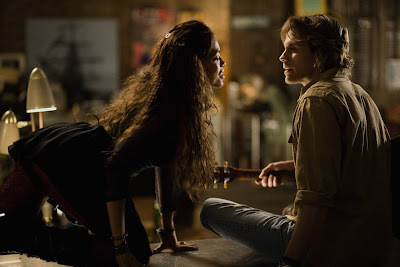 Rosario Dawson plays his romantic counterpart, Mimi, and mops their filthy loft apartment floor with him because she knows how to play for the camera. It doesn’t hurt that she can hold her own in the vocal and dance department either. And while on the subject of music, as this is a musical after all, there are certain numbers that pick up the pace of the film, like “The Tango Maureen” in its dream sequence group tango or “Light my Candle”, a seduction in low lighting, or even “Take Me or Leave Me”, where a newly engaged lesbian couple square off on accepting the other for who they are. With few other exceptions, the remaining musical numbers often feel tired and repetitive with moments of lyrical genius and reassuring insight that are sadly too few. Columbus tries hard to keep the gritty reality of these artists’ lives relevant and convincing, but crumbs on floors and duct tape on couches are not enough to ground these characters. The first two thirds of this film are supposed to sell these artists as one big family bound by their convictions but when they are nothing but these convictions, there is little else to hold them together. When actual tragedies start to happen in the last third, they are happening to hollow vessels hiding behind lifestyles and calling it art.